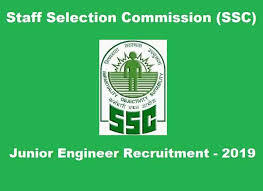 The Staff Selection Commission (SSC) has postponed the release date of the detailed notification related to the recruitment of Junior Engineer (JE). 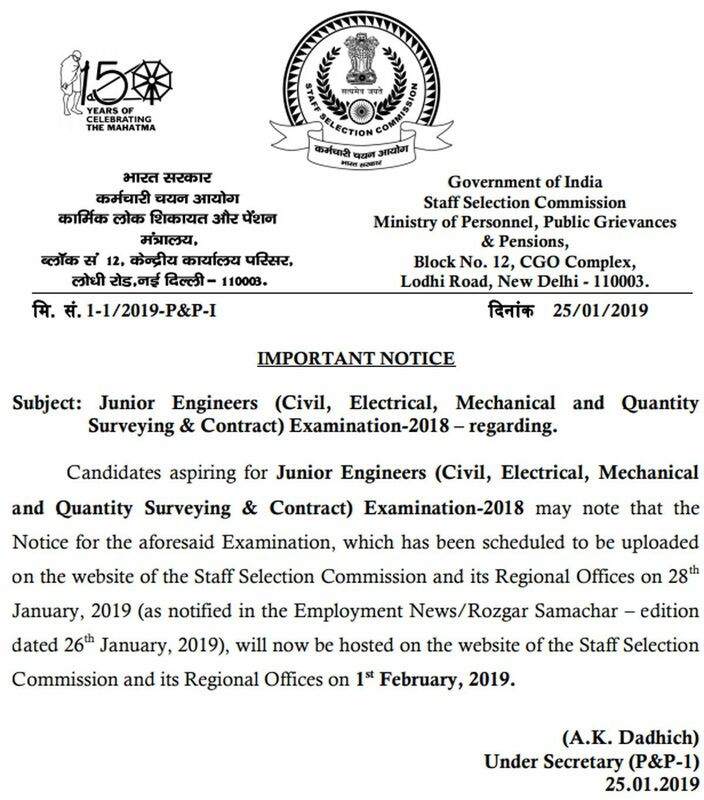 In a short notice, that was published by the SSC in Employment Newspaper in its January 26 to February 1, 2019, the SSC had mentioned that the detailed notification for Junior Engineers (Civil, Electrical, Mechanical and Quantity Surveying & Contract) Examination 2018, will be released on January 28, 2019 but now it has been delayed by four days. The SSC Junior Engineers (Civil, Electrical, Mechanical and Quantity Surveying & Contract) Examination 2018 will now be released on February 1, 2019. The SSC Under Secretary (P&P-1) A.K. Dadhich, in the notice, did not say anything about the last date of the application. Earlier, in the notice, the last to apply was February 25, 2019. The notice posted on the official SSC website says, "Candidates aspiring for Junior Engineers (Civil, Electrical, Mechanical and Quantity Surveying & Contract) Examination-2018 may note that the Notice for the aforesaid Examination, which has been scheduled to be uploaded on the website of the Staff Selection Commission and its Regional Offices on 28th January, 2019 (as notified in the Employment News/Rozgar Samachar - edition dated 26th January, 2019), will now be hosted on the website of the Staff Selection Commission and its Regional Offices on 1st February, 2019." Now, the detailed SSC JE recruitment notification will be made available on the SSC official website https://ssc.nic.in/ from February 1, 2019 and the online application process will begin on the same date i.e., from February 1, 2019. As of now, the last date to submit the application form for the recruitment examination of the SSC JE post is February 25, 2019. The candidates who are interested in applying for the post of SSC JE are advised to register for the exam before last date of application i.e. February 25 till 5 PM. The interested candidates are advised to keep visiting the official website regularly to get updates about SSC JE 2018-19 Exam. The Commission will conduct the SSC JE 2019 exam to recruit eligible candidates to the post of Junior Engineer (Electrical, Civil, Mechanical and Quantity Surveying and contract) across country.